Back in April of 1897, a field of 15 men lined up at the start of the inaugural Boston Marathon. The winner of that storied event, held on Patriots’ Day, a Massachusetts State holiday, was John J. McDermott who covered the then-shorter 24.5-mile “marathon” course in two hours and 55 minutes. One-hundred-and-nineteen years later, this same race has blossomed into not only the oldest modern marathon in the world, but also one of the most majestic and iconic running events ever. 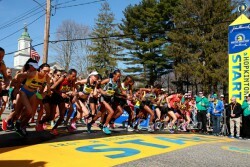 Monday’s 120th edition of the Boston Marathon, a point-to-point race from the sleepy village of Hopkinton to the heart of the largest city in Massachusetts, kicked off under beautiful early spring skies with temperatures in the 60s. Behind the start line were over 30,000 excited runners who had worked incredibly hard to “punch their ticket” into the prestigious race. After the mobility-impaired runners and wheelchair participants took off down the course, the elite women started precisely at 9:32 a.m. True to the start in prior years, the early downhill nature of the course called for caution and a large group was hesitant to open up the pace too soon. 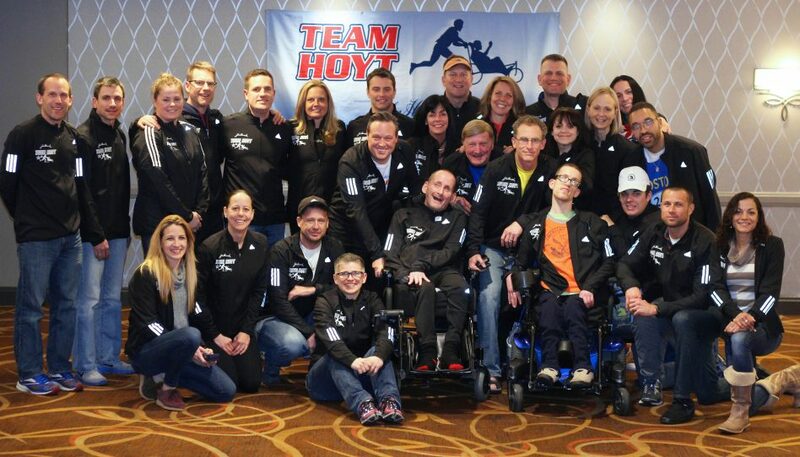 After passing the Team Hoyt wheelchair team, the women crossed the 5-kilometer mark in 17:41 minutes—on track for a relatively pedestrian 2:33 hours finishing time. The pace quickened, though, as a group of approximately 11 runners reached the 13.1-mile point in 1:15. After the 14th mile, where the famous Newton Hills begin, the dynamic remained unchanged, with Valentine Kipketer, Joyce Chepkirui, Flomena Daniel, all of Kenya, and Tirfi Tsegaye of Ethiopia leading the way. Tirfi and Joyce moved ahead and by mile 20 (1:54:15) Valentine was falling behind. The final 10K looked like it was going to end up as a footrace between Tirfi Tsegaye and Joyce Chepkirui with Tirfi pulling clear and Joyce falling back. But Ethiopia’s Atsede Baysa, a two-time Chicago Marathon winner, had a surprise in store. Atsede seemed to have found another gear as she first passed Joyce Chepkirui and then caught the leader, Tirfi Tsegaye, to break the tape on Boylston Street with both arms held triumphantly in the air in 2:29:19. 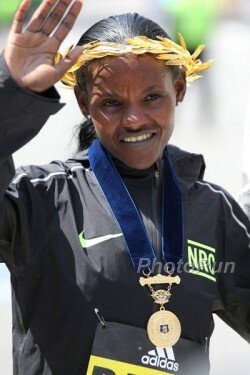 Second and third place went to Tirfi Tsegaye (2:30:03) and Joyce Chepkirui (2:30:50) respectively. The elite men departed Hopkinton 30 minutes after the women. A large group formed and held together through the 7-mile point (35:12) with several runners like Lemi Berhanu Hayle of Ethiopia, a 2:04 marathoner and the winner of the 2015 Dubai Marathon injecting test surges to try to break up the group. The ten-mile mark was crossed in 50:40 with Deribe Robi in the lead. 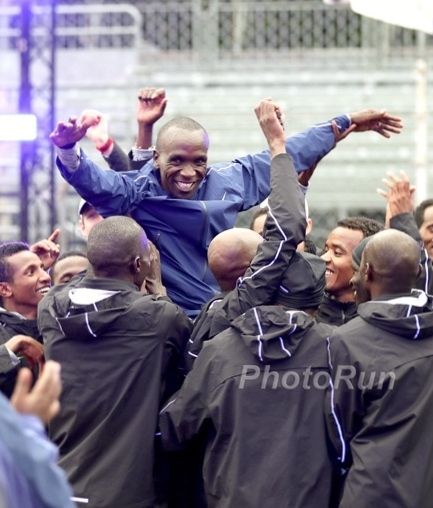 The Ethiopian runner headed a 15-man group until the half, which was crossed in 1:06. The big move in the race came at the 25K mark when Lelisa Desisa, a two-time Boston winner surged and only his 21-year-old countryman Lemi Berhanu Hayle was able to stay with him. Lelisa tested Lemi with quick injections of pace, but in the final mile, it was Lemi who had the last high gear and powered ahead for an impressive win. 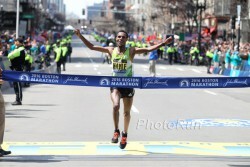 Lemi Berhanu Hayle wore a broad smile as he crossed the finish line in a commanding 2:12:45. “Very difficult,” were the only words Hayle could muster through a translator about his amazing performance. Fellow Ethiopian Lelisa Desisa was second in 2:13:32, while Yemane Adhane Tsegaye made it an Ethiopian sweep in 2:14:02. 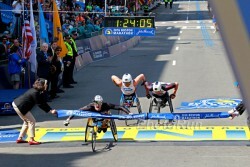 In the women’s wheelchair division, American Tatyana McFadden won her fourth-straight Boston in 1:42:16 ahead of Manuela Schar of Switzerland (1:43:30) and Wakako Tsuchida of Japan (1:43:34). The men’s wheelchair race came down to a three-way photo finish with Switzerland’s Marcel Hug just edging out Ernst Van Dyk of South Africa and Australia’s Kurt Fearnley. It was so incredibly close that all three were timed at 1:24:06. The Boston Marathon isn’t always about those who run fastest and is as much about grit, compassion, and perseverance as it is about speed. This storied race has a long history of charity running and this year’s edition was no exception. 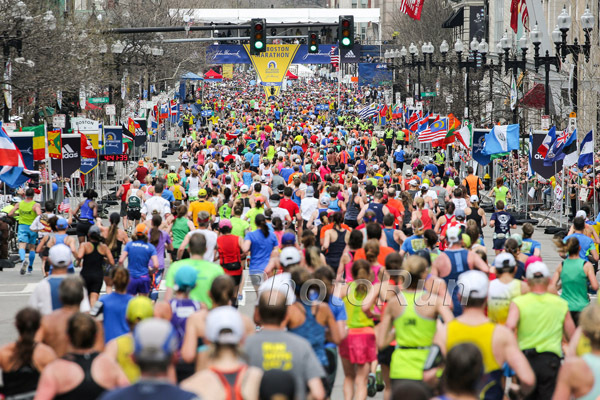 About 6,000 men and women in the field were running for others, with each raising a minimum of $5000 for their official Boston Marathon charity causes. Last year, the Boston Athletic Association, the race’s official governing body, reported that an amazing $28.3 million was raised for charity. One such runner, Peter Lorinser, from Michigan, ran his second Boston for the Dana-Farber cancer research program. “All the money we raise goes directly to innovative cancer research that wouldn’t be funded through any other mechanism besides through philanthropy,” he said. Peter ran 26.2 miles with the initials of patients who have both survived and lost their battle inscribed on his arms. 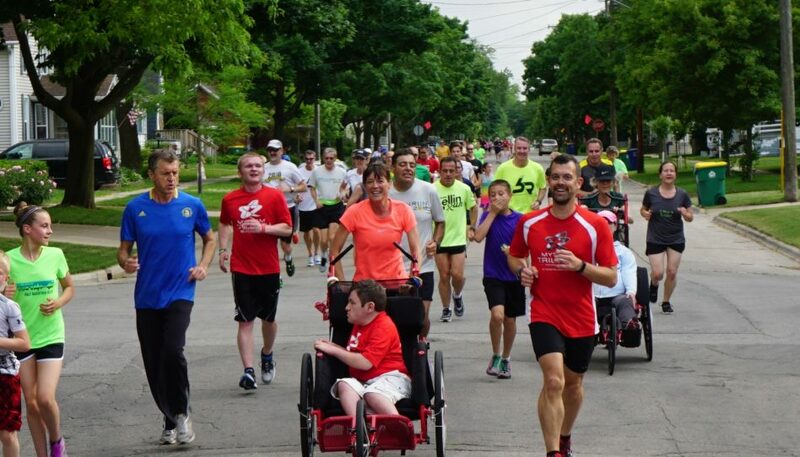 Before the race began the charity runner had raised a remarkable $10,000. 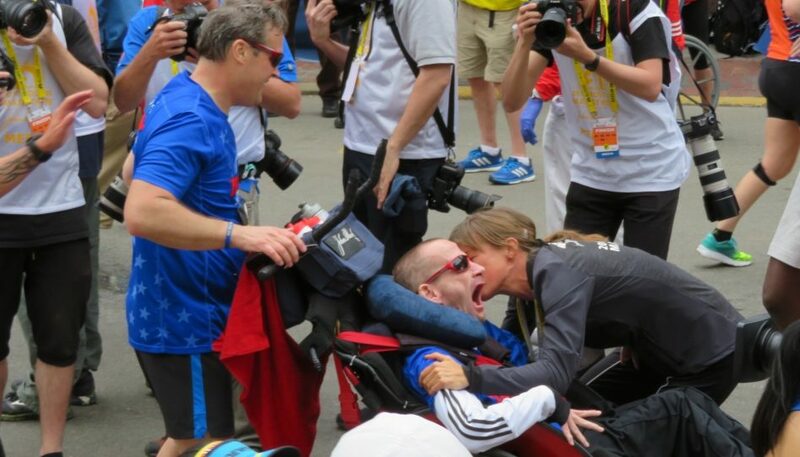 Take The Magic Step’s own Uta Pippig, a three-time winner of Boston was there to celebrate the 120th edition of the world’s oldest modern marathon and the 20th anniversary of her last win there in 1996. On Saturday before the race, she decided to lace up her running shoes and take to the streets of Massachusetts herself. An interview with Uta and WBZ TV can be found here: www.Instagram.com.